2 November 2012 – Is the fiscal decentralisation the main strategy for the countries in South-East Europe to face the financial challenges and to reinforce investments in local communities? What are the open issues related to the process of fiscal decentralization throughout the Region? Where and how should countries direct the future of fiscal decentralization? These are some of the topics addressed within the International Conference: The Future of Fiscal Decentralization in South-East Europe, that started on 1 November 2012 in Hotel Splendid, Budva, Montenegro, organized by the Network of Associations of Local Government Authorities (NALAS), in partnership with the Ministry of Finance of Montenegro and the Union of Municipalities of Montenegro. The Conference brought together over 120 participants, representing local authorities and local government associations from 12 countries in SEE; representatives of Ministries of Finance and other central government institutions from 7 countries; as well as financial institutions, international organizations, experts, CEOs and economists. In his opening speech, the Minister of Finance of Montenegro, Mr. Milorad Katnic said: “Crises force us to be more efficient, to provide better services with the money we collect. But, we also have to create better environment for economic growth that better heals poverty and employment”. NALAS Vice-President, Mr. Anton Pershak said: “While assessing the trends in fiscal decentralization it is important to take into account the following general guiding aspects: (1) Implementation of the national fiscal decentralization reform agenda; (2) Level of the intergovernmental dialogue; and (3) Financial indicators. Regarding the first point, NALAS analyses conclude that there is no continuous progress in fiscal decentralization throughout the Region during the last 2-3 years. 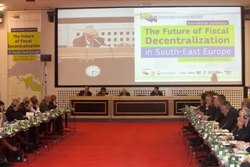 In Moldova and Romania, and even in my country, Slovenia, there is even a trend towards re-centralization”, said Pershak. “We agree that the process of decentralization should be perceived as a consequence of the need for democratization of the society. The economic development on the local level is a key element of meeting the needs of the people. Local development and jobs are what people primarily expect from the process of decentralization”, said Mr. Aleksandar Bogdanovic, Mayor of Cetinje and President of the Union of Municipalities of Montenegro. “The policies implemented in Montenegro so far have given important results. I would remind that Montenegro, before the crisis, was one of the fastest growing economies in Europe, with the highest level of FDI per capita”. “I often hear from central governments that municipalities do not have the capacities to implement the fiscal decentralization-and this is their excuse for not advancing the fiscal decentralization process. This is simply not a valid excuse. We all have to work together to further develop the capacities of the local governments”, said Ms. Ginka Chavdarova, Executive Director of the National Association of Municipalities of Bulgaria in her speech about the challenges of the local government associations in supporting their members, the local governments, to strengthen local administrative capacities. “We have to emphasize that there are three important tracks in fiscal decentralization: increase of inter-governmental transfers, increase of own revenues and removing the burdens of municipal borrowing”, said Mr. Peter Clavelle, Chief of Party of the USAID Planning and Local Governance Project in Albania. “NALAS made a powerful study of the trends of fiscal decentralization in South-East Europe. We have used this study in our work in Albania and we have to continue doing so, we have to have an evidence-based approach in advancing fiscal decentralization”, stressed Mr. Clavell. Mr. Anthony Levitas, a world-known expert in intergovernmental finance, alerted that: “The level of transfers from central to local governments is insufficient for them to deliver the services they are mandated to. Throughout the SEE Region, collecting taxes remains the main problem for both central and local governments, while the “blame-game” between the two continues. Also, tax base throughout the SEE Region is highly concentrated in a few cities, often the capital city”. Facilitating the access to the credit market.